La Crosse, Wis. (August 1, 1961) – Two-time Minnesota state big car champion Jerry Richert of Forest Lake, Minn., won top honors at the La Crosse Inter-State Fair, but it was Bill Hobbs of San Francisco, Calif., who ‘stole’ the spotlight on Tuesday night…literally. Richert turned in the fastest time during qualifying (24.88 seconds) on the half-mile dirt, won his 7-lap first heat in 3 minutes’ flat, set a new track record in the 4-lap trophy dash (1 minute and 40 seconds) and captured the accident-shortened 15-lap championship feature. Hobbs, however, stole the spotlight(s) in the feature after winning the 6-lap third heat in 2 minutes and 48 seconds. The Californian speedster crashed into the power plant at the second turn after completing two laps of the feature event – and that knocked out the lights. IMCA officials red-flagged the field following two laps under starter Jake Bozony’s caution flag when it was discovered that the damage could not be repaired immediately. All the lights on the backstretch were disabled after Hobbs Offy went off the track and into the infield. Hobbs was uninjured. 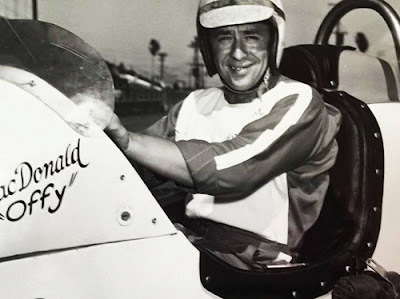 Buzz Barton of Tampa, Fla., a pre-race co-favorite with Richert, won the 7-lap second heat in 3 minutes and 2 seconds and Ralph Donaldson of Jackson, Mich., won the 8-lap consolation in the record time of 3 minutes and 38 seconds. Race stopped after four completed laps, including two under caution after Hobbs hit power plant.